We all had seconds. Some even had thirds. My sister-in-law said, “Please remember what you did”. 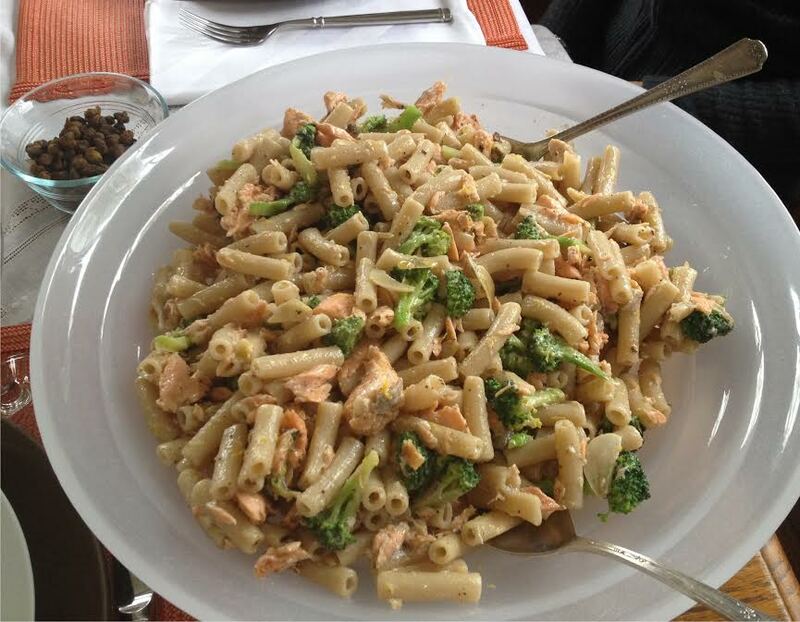 This Pasta with Salmon and Broccoli was a lunch dish for the four of us. I made it up. The combination of ingredients was simply something I had in my head that I wanted to eat. I looked for a bit but couldn’t find any recipe that resembled what I had in my mind. This worked, really well I might add! My sister-in-law, Trish, is gluten intolerant so I used a brown rice pasta – penne – and we all agreed it was decidedly lighter that way. My brother Steve brought a beautiful bottle of Sancerre to pair with this and it was perfect. An ideal Saturday afternoon lunch! There are a fair amount of steps in this recipe, but they are all simple and at least three of them can be done in advance – from the fried capers, to the spice rub for the salmon (which can be used on any fish), and the blanched broccoli florets. Everyone thought there was cheese in this dish but no, no cheese, (the Italians taught me to NEVER combine cheese and fish), yet the yogurt provides the satisfying creaminess, in a much healthier manner. 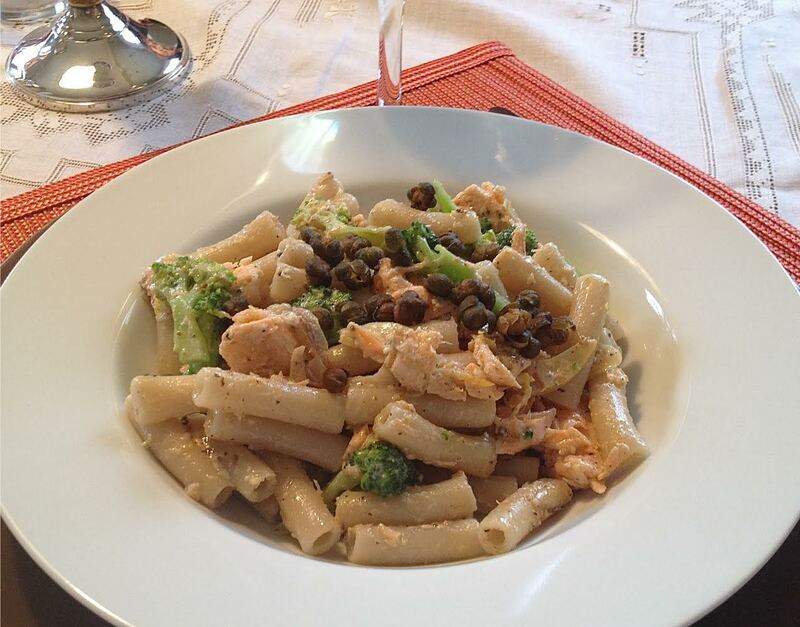 The broccoli had a bit of crunch, in contrast to the creaminess of the salmon with the tang of the lemon zest, and every once in a while, encountering the crunch and punch of saltiness from the fried capers, all made this recipe is a keeper. Make it with LOVE, serve it with some crusty bread and a crisp white wine, and I guarantee you’ll feel all warm and satisfied after a meal like this. PREPARE THE CAPERS: In a skillet, heat 1/4 inch of vegetable oil until shimmering. Add the capers and stand back until all the moisture is out of the capers. Remember, oil and water do not mix (I learned this from my old printmaking days) so do not try to stir until all the nonsense (splattering) is over. Fry over moderately high heat, stirring, until browned and crisp, about 3 minutes. Using a slotted spoon, transfer the capers to paper towels on a plate to drain. Set aside. MAKE THE FANTASTIC FISH RUB: This is for approximately 3 lbs. of fish, so you will have some of this lovely stuff left over to use later. Throw it all in a mini spice grinder and grind up. Use on fish to cover – Great on cod, scrod, salmon, tilapia, shrimp, swordfish, Chilean sea bass, or really any hearty, meaty fish. Use the Canadian cooking method for roasting or grilling any type of fish. Figure on 10 minutes for each 1 inch of thickness at 425 degrees. 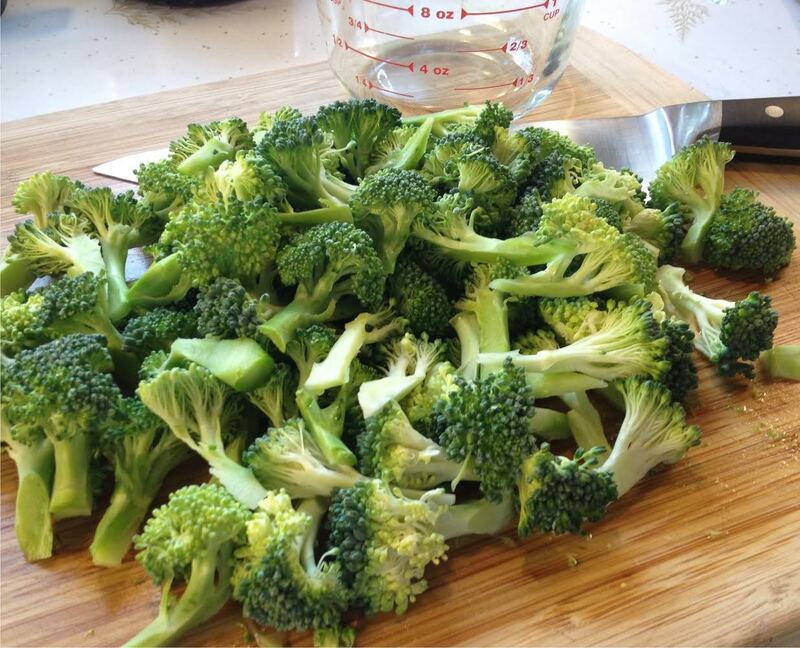 MAKE THE BROCCOLI FLORETS: Wash and cut your broccoli as shown here in the photo. 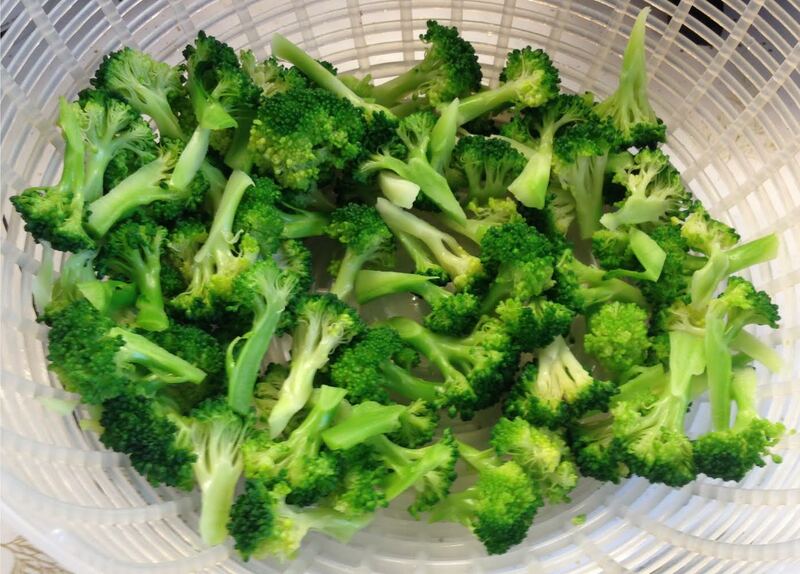 Bring a large pot of water to a roiling boil, salt it with coarse sea salt, add the broccoli flowerets and let them be in there for 1 minute, until they turn bright green. Drain and immerse in cold water with ice cubes to stop the cooking. Drain and pat dry. MAKE THE SALMON: Wash and pat dry the salmon. Spread the 2 tsp. of Dijon mustard on top, salt and fresh ground pepper, and generously sprinkle on evenly some fish rub to coat. Heat a non-stick skillet on medium high heat with 1 Tbs. olive oil. Put in salmon, seasoned side down for 3 minutes. Carefully turn over and put in the oven for 8 minutes. When finished, remove from the skillet and place on a platter. Flake the salmon after about 5 minutes. Bring another large pot of water to boil for your pasta. Meanwhile, warm the olive oil over low heat. Add the garlic slices and warm up, stir, let them only get slightly golden. Add the broccoli flowerets to warm and cook them a bit more. Salt the pasta water generously with coarse sea salt. Start cooking your pasta until al dente, about 2 minutes less than the package directions tell you. Flake the salmon from the skin (discard) while the pasta is cooking. Measure out your yogurt too. Save at least a cup of the pasta water, and drain the pasta. Add the pasta and 1/3 cup pasta water to the broccoli with the garlic and toss and cook a bit more until pasta is done. So now you need to combine everything and make this magnificent dish! In a large shallow bowl, combine the pasta-broccoli-oil combination, the flaked salmon, and the yogurt. Gently fold all together. Zest the lemon on top. Fold again. Only add more pasta water if necessary. Taste and season with salt and pepper. Serve and top with the fried capers for extra crunch and salt. Enjoy! I love the combination of ingredients here, healthy delicious pasta! I made something similar before, but with tuna. This looks so delicious! A marvelous post, Mary. I always love eating my pasta with broccoli but I loved this meal even more since it was full of so many flavors! I don’t really like the taste of Dijon mustard so I omitted it and spiced this dish up with some chilli flakes.